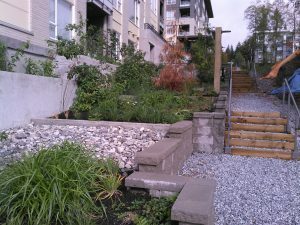 Rain Garden and Infiltration Systems | Keystone Environmental Ltd.
With the rising density of housing in Metro Vancouver, many Municipalities are promoting the use of rain gardens and infiltration systems to reduce the volume water entering our storm sewers. Keystone Environmental Ltd. has been assisting residential developers and industrial properties with water reuse and infiltration initiatives. Our civil engineers can assess the current stormwater generated at the site and determine engineered solutions to allow future upgrades on the site but maintain the same flow rate of water to municipal sewers. Rain gardens and infiltration systems reduce localized flooding, reduce water quality contaminants from entering the receiving environment, and reduce overflow to rivers. The infiltration of stormwater also recharges groundwater resources, maintaining the water balance in the watershed. This reduces the potential for drought conditions and retains water for plant growth. With the increasing volume and intensity of rainfall events due to climate change, the overtaxing of our existing sewer infrastructure is at an all-time high. This increases the potential for flash floods or landslides that affect safety. We can avoid reaching these extremes by promoting rain gardens and infiltration systems sooner rather than later. It can be incorporated in a new development or retrofitted in an existing site. Keystone Environmental Ltd. is experienced in designing infiltrating and self-contained rain gardens. Rain gardens are typically smaller and capable of surviving drought conditions or intense rainfalls. They can be a landscape feature that beautifies an otherwise impervious surface. 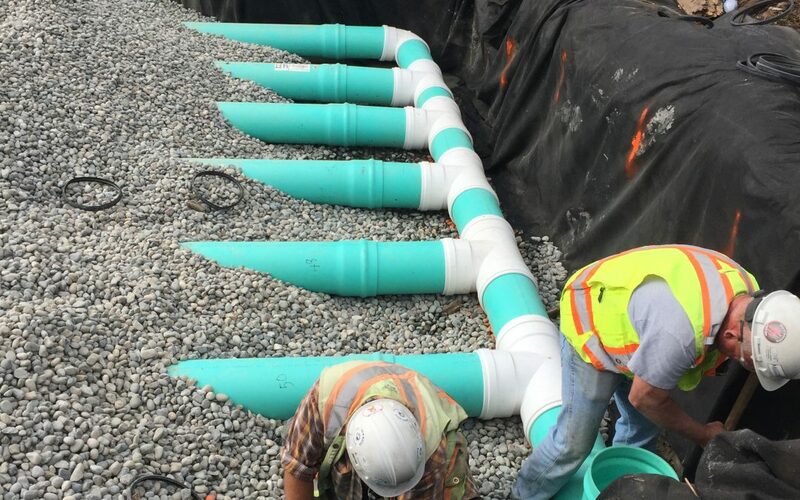 Infiltration systems are typically larger than rain gardens, include underground piping to return stormwater to the ground water and have the option to overflow to sewers in the event of blockages, so that building footprints are not affected. Some of the key limitations to installing a rain garden or infiltration system is knowing your size constraints, understanding the soil properties, requiring a flat or relatively gentle slope to install and understanding that the long term function of the systems require regular maintenance. As community densification leads to a reduction in natural infiltration areas, we anticipate more new developments are going to need to be augmented with modern infiltration systems. Let us know if you need a solution for a stormwater management issue.